Reality Rundown: Hallelujiah! These Shows Are Almost Over! The Biggest Loser - The final 4 head back to their hometowns to get on the scale again and show them how much they have changed since week 1. The happiness is kind of short lived because now the 4 have to adjust to losing and maintaining their new weight loss in the real world. Daris struggles most, binging late at night. On the up side, the binging kind of looked like bran cereal and turkey breast. Koli opts to spend his month at home in Las Vegas with a mixed martial arts trainer because he's more focused on the final prize rather than adjusting to real life. All 4 losers run the pre-requisite season ending marathon with visits from previous losers. Daris breaks the time record, finishing the marathon in 4 hours and 2 minutes. Bad news is at the final weigh-in, Daris gains 2lbs. Lucky for him, there's no vote by the contestants; America chooses who will be the 3rd person in the finals. Right now, Ashley and Michael are the official finalists, so will the 3rd spot go to shy guy Daris or recent braggart Koli? I don't know who you're voting for, but chances are my mom is clicking Daris 100 times on NBC.com. American Idol - The final 3 get to perform 2 songs to torture our ears. The 1st song is selected by the contestants and only Lee Dewyze came out to win tonight. Is it just me or does Crystal seem to be intentionally trying to lose? The judges get to pick the 2nd song and, what a surprise, these song choices are far better picks than their own selections. I know a few weeks back I declared a moratorium on Jeff Buckley's "Hallelujiah" on this show, but Simon picks this song for Lee and it's so good. Not that I even care who wins this show, but Lee seems to be the be the best pick because: 1. he actually wants to win, 2. he could actually be marketed and played on the radio, and 3. teen girls and their moms love him. The results show is so much filler that I am able to watch the whole show in 6 minutes. 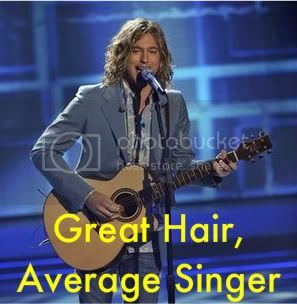 We endure an outbreak of Bieber Fever, a terrible singer discovered by Perez Hilton, oh and Casey James and his beautiful mane of hair are sent home. Crystal Bowersox and Lee Dewyze are the final 2 and next week, this season of torture ends. Hooray!